PEW Trusts June 2013 Issue Brief "In Search of Dental Care"
Increase awareness of the importance of oral health to overall health and well-being. Increase acceptance and adoption of effective preventive interventions. Reduce disparities in access to effective preventive and dental treatment services. The National Health and Nutrition Examination Survey (NHANES) has been an important source of information on oral health and dental care in the United States since the early 1970s. NJDHA has been working with the American Academy of Pediatrics NJ Chapter “Pediatric Health Home Subcommittee”, thanks to the efforts of Yvonne Goldman (N). This subcommittee has developed a website through the funding of DentaQuest & Delta Dental grants. The website provides not only oral health info, but info on accessing pediatric providers & insurers. The resources page lists dental clinics in NJ, including the dental & dental hygiene educational programs. The sponsor scroll includes NJDHA along with Rutgers Dental, AAPNJ, NJDA and, NJAPD. NJDHA has aligned with the NJ Chapter, American Academy of Pediatrics to work toward the establishment of a dental home by age one. NJ-AAP, working with a variety of stakeholders including NJDHA, NJDA, & NJAPD, presents events to bring together pediatricians, pediatric dentists and RDHs. Updated to reflect the need for FL varnish in children 6mos-5years. "Fluoridation Advocacy; PEW's Contributions & Lessons That Emerge"
Case studies on success, and failure, in achieving water fluoridation. 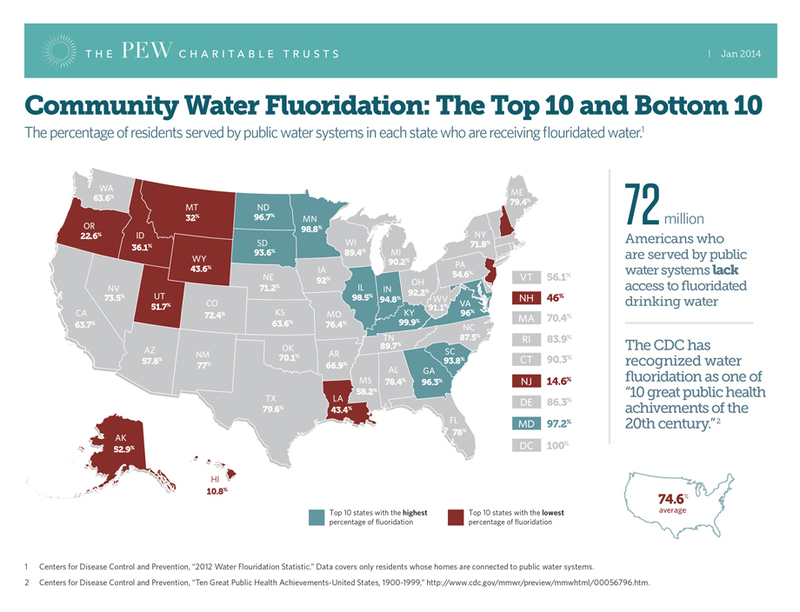 Pew Trust has issued an "F" to NJ's water fluoridation efforts, with only 14.6% NJ citizens with access to water fluoridation as per CDC. Click here to see CDC statistics for all states as per 2014 - New Jersey ranks 49 out of 50..
Campaign for Dental Health "Life is Better with Teeth"
NJDHA partners with Eastern International College Dental Hygiene Program to provide prevention for Special Needs Chidlren and 3rd Graders in Jersey City. NJDHA develops a Pediatrics Study Club and works with the American Academy of Pediatrics of NJ to advance access to care for NJ children. Contact Executive Director Becky Pugh executivedirector@njdha.org for more info.